Klaus Moje, who has died aged 79 in Canberra, was one of this region’s most influential artist craftsmen. He was the founding Head of the Glass Workshop at the Australian National University School of Art, and extraordinarily influential in the development of the arts scene in Canberra, and studio glass art in Australia and internationally. Moje was born in Hamburg, Germany in 1936, into a family of glass workers whose business specialised in providing bevelled and decorated glass for objects such as mirrors and shelving. He gained a journeyman’s certificate as a glasscutter and grinder at the age of 19, and won a scholarship that led to a master’s certificate from the Rheinbach and Hadamar Glass Schools in 1959, where he imbibed the modernist aesthetic of mid-century European design. Moje worked as both a technician and artist in the 1960s and 1970s, focussing on architectural stained glass and the promotion of studio-based glass art in partnership with his first wife Isgard Moje-Wohlgemuth; their studio and gallery became the home and genesis of ‘studio glass’ in Germany and part of an international movement wherein they established networks across Europe and the United States. Moje’s practice developed rapidly in the 1970s and by the early 1980s his signature mosaic glass in brilliant colours and bold patterns had appeared. In 1982 Moje was invited by Udo Sellbach, the inaugural director of the then Canberra School of Art, to establish a Glass Workshop at the school, and he subsequently taught there for a decade. The workshop was innovative in employing fusing and coldworking techniques and Moje, having met the entrepreneurs of Bullseye Glass at the Pilchuk Glass School in Washington in 1979, instigated the development of their new fused glass. He was a seminal figure in professional glass art and training in Australia and put Canberra on the map as one of the most important centres for studio glass in the world. In addition to training several generations of Australian glass artists with international reputations, he was instrumental in the establishment of the Canberra Glassworks in the former Kingston Powerhouse in 2007. Following his retirement from the School of Art in 1991 Moje maintained a vigorous studio practice with his wife Brigitte Enders, a ceramicist, on the south coast of New South Wales and in Canberra, and continued to travel, lecture and undertake workshops in Europe and the United States. He remained at the vanguard of contemporary international glass arts practice. Moje’s practice was innovative and extraordinary, and evidenced consummate technical skill and conceptual thinking. His passion for colour was one of his trademarks. 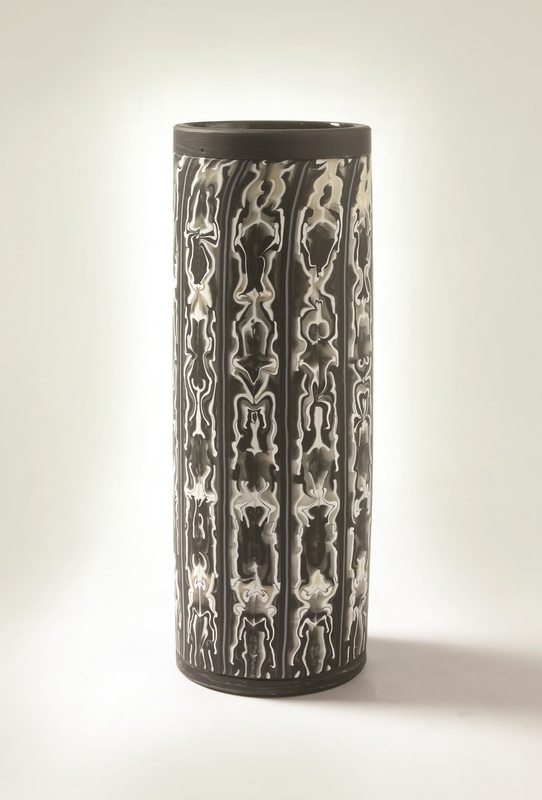 Moje’s work was included in dozens of exhibitions from Shanghai to Stockholm, London to Los Angeles and Tacoma to Tokyo, and is held in more than 60 international public collections, including the Metropolitan Museum of Art, New York; the Victoria and Albert Museum, London; the National Gallery of Australia, Canberra; and many regional, corporate and private collections across the world. In 2006 Moje was made an Honorary Officer (AO) in the General Division of the Order of Australia. Untitled from the Niijima series (1999) is exemplary of the roll-up technique that came out of Moje’s period as artist-in-residence at the 10th International Glass Festival at Niijima in Japan in 1997 and was perfected on his return to Australia with colleagues Kirstie Rea and Scott Chaseling. This series is characterised by blown glass of pure colour and carefully controlled design using only sheet glass, a kiln, a glory hole and basic hotshop tools.